Matt Scully talks to the Common Council Health, Welfare and Public Safety Committee, Thursday in City Hall, as his children wait. There’s a ‘pedestrian audit’ underway; who knew? “When it rains, it causes the biggest headache and it’s also a major, major health hazard,” Matt Scully said at the outset of the meeting. Scully said he’d bought his home on County Street 10 years ago, knowing that it had never had flooding problems since it was built in 1951, but for the last four years it’s been “absolutely awful” as water from a nearby pond overflows into his driveway and then his basement, and he has to spend two or three hours getting the water out. Then he has to treat it with bleach the next day. A graph shown Thursday in City Hall illustrates the sudden increase in complaints about flooding. A neighbor told a similar story. “In the last year it went from not being a problem to it being overflowing,” he said, describing water up to his ankles in the basement. He blamed the flooding on a nearby storm drain that he believes is 90 percent clogged. A neighbor is moving out due to black mold in the neighbor’s basement. “My property value is going to take a hit for this and I am not going to stand for it,” he said. 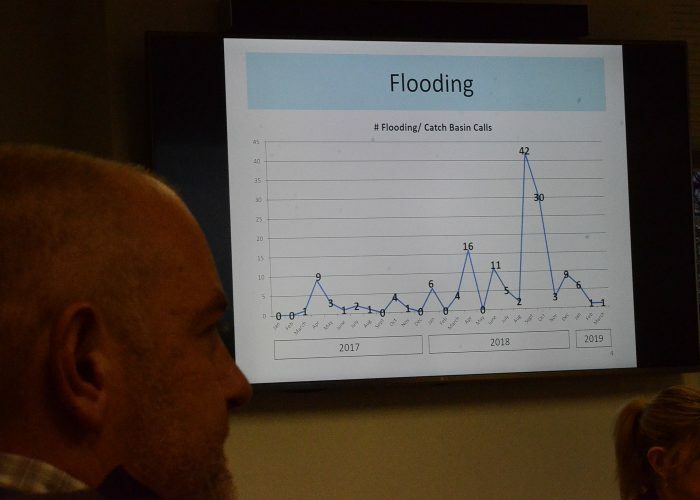 A “two-pole approach” might be in order to tackle the “environmental health as well as the health of the residents,” Sacchinelli said, explaining that he’s discussed the widespread flooding complaints with Public Works Committee Chairman John Igneri (D-District E). City resources could be used more discriminately, as when there’s an area with a long-term engineering study, lights and signs could be posted to warn people off instead of a police officer, he said. “This is the issue we’ve heard of the most and it seems to be getting bigger and bigger and bigger,” Council member Eloisa Melendez (D-District A), a Public Works Committee member, said. Melendez requested detailed information about where complaints are originating. Health, Welfare and Public Safety Committee members are invited to attend Tuesday’s Public Works Committee meeting to learn about efforts to address flooding, Sacchinelli said. Council member George Tsiranides (D-District D) commented that Norwalk Chief of Operations and Public Works Anthony Robert Carr, who just began on the job, was hired largely for his expertise in flooding issues. “Hopefully he’ll be a good addition and help dramatically with what’s going on right now,” Tsiranides said. These things take time, Council member Doug Hempstead (R-District D) said to Tomasino, warning him that studies and a lengthy process are involved. Norwalk Chief of Staff Laoise King will be invited to deliver an update on flooding concerns at a future meeting, Sacchinelli said. Council members also considered citizen complaints regarding dust from contractor yards or illegal rock crushing. Residents complain but the offended closes up shop after two or three days as the process of Zoning enforcement has just started, Wrinn said. “That creates stress, there’s no controls in place,” he said. Hempstead wondered if there could be a way for a police officer to hand out tickets, and Tsiranides suggested maybe a line on a permit application that asked if there would be rock crushing onsite. Sacchinelli speculated that another body might be needed in customer service, and Melendez got teased regarding the possibility that her Ordinance Committee might have to tackle another weighty issue. “The whole point with ordinance is how it will be enforced,” Melendez said. During the meeting there was significant discussion between Council members and two interested citizens sitting in the audience. Diane Lauricella said she’d advocated better regulation enforcement during a Mayor’s Night Out some time ago, and “never heard back” from City Clerk Donna King, whom she’d been told to follow up with. Planning and Zoning is chasing people all over town and Planning and Zoning Director Steven Kleppin has a pilot program for another approach, Wrinn said. Enforcement officers are concentrating on a small area rather than waiting for complaints to come in, he said. P&Z has targeted Lubrano Place and Lexington Street for two weeks and issued 16-17 violations. “It is very difficult with a town the size of Norwalk to keep going out to the outlying areas trying to find a time to see a truck and take photos of it,” Wrinn said. For years, Norwalk has been fixing sidewalks in conjunction with its paving program, on the theory that the equipment is in the area and the two projects go together. Identifying dangerous sidewalks would fall under the Health, Welfare and Public Safety Committee’s purview, Sacchinelli said. Kathryn Hebert, former Administrative Services Manager, has a new title due to Mayor Harry Rilling’s recent reorganization of City administration – she’s now Director of Transportation, Mobility and Parking (TMP). Hebert said Thursday that the new department is working with the Bike/Walk Commission on pedestrian safety. TMP is under the economic development component of the new City government structure. The sidewalk program isn’t developed yet, but TMP is working collaboratively with the Commission and the Health Department to create a plan, she said. There have been 60 response to a pedestrian audit posted on the Health Department’s website, Director of Health Deanne D’Amore said. Council members expressed surprise, as they hadn’t known there was a survey. D’Amore said it’s been pushed on social media. 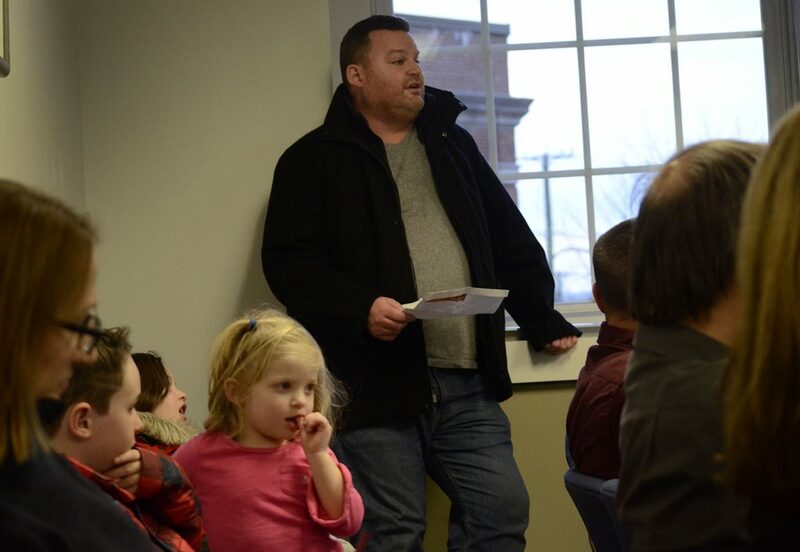 Committee members decided to ask Norwalk Communications Manager Joshua Morgan to attend a future meeting and discuss outreach efforts, including an effort to publicize the customer service department. We’ve had some heavy rains this year, but as Scully points out its only the last few years that we’ve experienced more problems. It’s amazing what happens when your crews are actually cleaning storm drains like we used to. Look all around the city. Routine maintenance that used to be done is being ignored. 3 foot tall grass everywhere is easy enough to see. Streets sweeping was a preventative measure to keep drains cleaned. Have you seen one lately? The field at Cranbury School has been a duck pond for most of the last year. Guess what, the drain which hasn’t been cleaned out in years was clogged. We’ve had heavier rains and it never flooded like that. This is what happens when you bow to work rules over the interests of the city. The city ordinance on sidewalks requires that the mayor cite anyone with poor sidewalks and force them to fix them. The city will even facilitate an interest free loan to accomplish this. Why is the Rilling Administration blocking’s sidewalk repair? Why will the council not force him to act? One wonders what steps the Mayor is taking to ameliorate the huge expecgted environmental impacts upon the City from the billion dollar Walk Bridge project – the largest public works project in our City’s history – that will disrupt Downtown for years and cause untold tens of millions of damage to businesses, citizens and our City’s institutions like the Aquarium. So far these economic and environmental costs have not been publicly discussed. Downtown residents Have long been negatively impacted from the environmental pollution from I-95 truck and auto traffic. And that pollution is bound to grow by leaps and bounds in future years and decades. Rilling and King (Mayors 1 and 2) and Eloisa Melendez (Ordinance/CC): ARC! – how is it going buddy? Harry here. I hope first few weeks on the job are going well. Hey, got a second? Anthony Robert Carr (new DPW guy, specialty in flooding): Hey – going well , thanks. What’s up? Rilling: Cool. Say, we got our butts handed to us last night in a meeting about flooding. I’ve got King and Melendez on conference call here. Sounds like we can attack this short term and long term. ARC: Right, I read that in Nancy on Norwalk. People are mad on County Street. RK and M: Short term, can you head over to check the key sewer drains over there today? Drop in to see the taxpayer and his neighbors, better yet – call them after you visit to give them a heads up. Leave a voicemail if you have to. Bring that big ol’ vacuum truck over there. ARC: Sure. Got a lot of stuff going on but I hear you. We need triage mode. Hold the million dollar studies for now, maybe it’s just leaves and a mess of tennis balls, lacrosse balls, baseballs n sticks that’s jammed up. R, K and M: Wow, that’s great. Just text us back with a quick heads up, maybe snap a pic we can bounce to Nancy for a quick update. Long term, maybe we got problems but let’s not throw cash onto the fire just yet. We need a brief recap, put a point on the scoreboard quick then we manage it accordingly with an update of our Top10 list we have cooking. ARC: No worries. Happy Friday! You’d think with Melendez’s quote of ““This is the issue we’ve heard of the most and it seems to be getting bigger and bigger and bigger,” Council member Eloisa Melendez (D-District A), a Public Works Committee member, said” that someone’s hair would be on fire and the city would have AT LEAST a more coherent response. But of course not. “Bigger and bigger and bigger” translates to not gallons per minute, sticks per minute, clogs per minute, rain per minute. What changed the past what, 3 months that brought this on as THE MOST common issue issue?! PROACTIVELY Project Managed? Nah…..We are on Planet Public Sector where the basics are lost and the BS continues while the Private Sector would have had this handled proactively, EVEN IF THERE WAS NOT A FINAL SOLUTION the other night. Is it me or is there too much blindsiding that the CC and Townhall continues to get exposed by?! The optics on the way this is handled are awful. In 2005 Norwalk’s Mayor’s salary was about $95,200 when property taxes were very much lower. Currently its about $150,000 or about the same as the CT Governor who oversees a $20 billion budget with tens of thousands of employees. At least for the past 4 decades I’m aware of Norwalk’s Mayors have never “managed” the City. None have ever managed large entities prior to their elections. Our City has long been managed by its Department Administrators with some inputs from the Common Council. None that I can recall ever had major management expeience either. Whether the City would be managed at much lower cost is up for discussion. Danbury manages to provide City services at 30% less than Norwalk. Greenport has long had Professional Manager. Best I’m aware of Greenwich is considered very well managed. Most cities in the nation the size of Norwalk are manage by Prof. Managers. Over the years there’s never been much enthusiasm for hiring a Prof. Manager in Norwalk to lower our high cost of providing City services. We’re a transient City. So those concerned about high taxes leave. No new Mayor coming into officer in Norwalk has ever lowered taxes. Nor have they ever been kept constant. So as the sun rises in the east and sets in the west taxes in Norwalk will always likely go up providing the same services. Just more costly. There was a time when City employees made much less than City residents. That’s been reversed. There was a time when almost all City employees lived in Norwalk. Now few do claiming property taxes are too high. Norwalk has a reputation for paying high salaries. I have lived on Lawrence Street in South Norwalk for 27 years. For about 19 years I have never had a flooding problem. Not my basement nor my street. Now I have the worst.